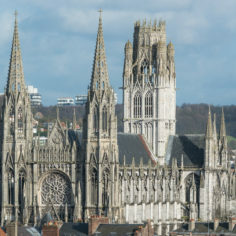 The objective of the organ masterclass is to introduce participants to the art of Aristide Cavaillé-Coll through his beautiful masterpiece in St. Ouen Church in Rouen, only one hour by train from Paris St. Lazare train station. 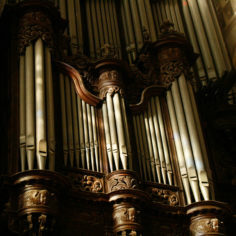 In addition to interpretation, the course will focus on registration and the management of large and complex acoustics and will give participants the opportunity to immerse themselves in the sounds of the French symphonic organ. Participants will also have the opportunity to play a closing concert on Sunday August 11. 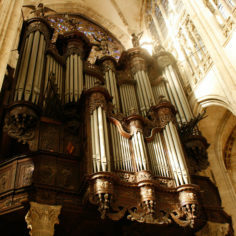 The course includes group lessons from Monday to Saturday from 9 am to 1 pm, visits to other organs in the city, the opportunity to practice during the afternoon on the Cavaillé-Coll of St. Ouen and other organs in the city (the Cavaillé-Coll of St. Godard and the Kern organ of St. Maclou), a participant dinner on Saturday evening and a class concert on Sunday, August 11 at 4 pm in St. Ouen. This masterclass is open to advanced organ students, 8 students will be selected. 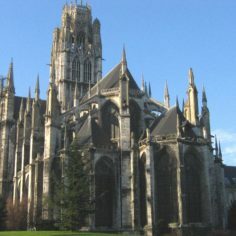 The course will be conducted by Jean-Baptiste Monnot, currently organist of the Cavaillé-Coll organ at St. Ouen church in Rouen. Course will take place from Monday to Saturday from 9 am to 1 pm. 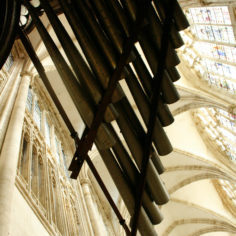 On afternoons, articipants will have the possibility to work on the organ and to visit other organs in the city (the Cavaillé-Coll of St. Godard and the Kern organ of St. Maclou). Class concert will take place on Sunday, August 11 at 4 pm in St. Ouen. This masterclass is open to advanced organ students. – a list of repertoire prepared for the masterclass. Closing date for application : May 26, 2019. The selection will be made by June 10, applicants will be notified by email. Founded circa 750, St. Ouen church abbey was one of the most powerful Benedictine monastery. The building of the actual church began in 1318 and lasted more than two centuries, even if some parts were finished in the 19th century. After the French Revolution, the local council moved in the former monks’ dormitory, built in the middle of the 18th century. The abbey church stands within the former monastery’s gardens. The church is 137 m long, under 33 m of vaults, this is only a few meters smaller than that of Notre-Dame of Paris. The great organ, the last masterpiece built by Aristide Cavaillé-Coll, is one of the most recorded organs of the world and one of the most beautiful from the symphonic period. 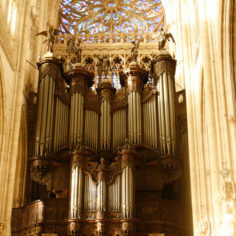 An organ was built in 1630 by Crespin Carlier. In 1888 Aristide Cavaillé-Coll awarded the contract to rebuild it, as the organ had fallen into disrepair. Cavaillé-Coll re-used the existing pipework and stops in good condition and kept the casing of 1630. The organ contained 64 stops, 84 ranks, spread across 4 manuals and pedal. The manuals contained 56 notes, and the pedal 30. This 4-keyboards and 64-stops organ was inaugurated by Charles-Marie Widor on April 17, 1890. 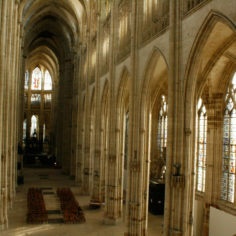 Later, his Symphony Gothique, was premiered on this organ, and dedicated to the memory of bishop St. Ouen of Rouen. 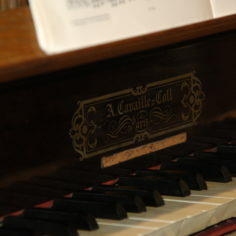 The organ case is listed as Historical Landmark since 1970 while the instrumental portion since 1976.